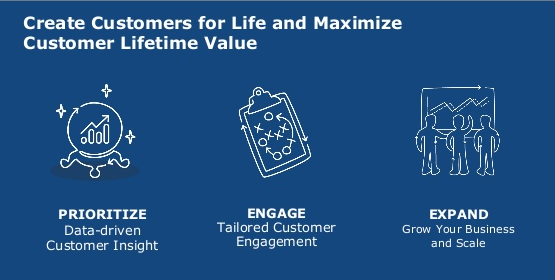 What does Customers for Life mean? Site Performance and Offload - Is their site performing as they had planned? Inquiries & Deflections? Consumption Against Commit - Are they using what they purchased? Competitive Insight - Ability to bubble up competitive factors on an Account? Customer Satisfaction - Are customers happy? qualitatively? quantitatively? Customer Cases and Incidents - Are customers getting their issues resolved and in a timely manner? Configuration Updates - Are customers using the latest versions of software or components? Professional Services Projects - Are ProServ projects with customers being managed appropriately? It was an explanation for their approach to working with their customers and making them life long customers. I had seen previous graphics, like below, but what really stuck with me was how comprehensively they look at all aspects of customer relationship health to develop their 360 degree perspective. Not saying this always happens for all clients, but it is ambitious to empower sales and support teams with these types of goals. A few weeks back I was listening to one of my favorite BLOGs, ButtonClickAdmin, as a podcast. The title of the podcast was How Admins can use Agile with Kelly Currier. I was delighted because not only was it an approachable review of how Salesforce admins could use Agile, but really how anyone could use Agile for whatever project or process they were working on. Kelly knows something about Agile because she heads up the Agile Delivery Methodology program for Salesforce.com’s Technology & Products organization -- I knew her moon's back when our paths crossed at Macromedia. I highly recommend the podcast to anyone interested in Agile, in the workplace. Additionally, Kelly mentions a YouTube by Henrik Kniberg, called Agile Product Ownership in a Nutshell and it is a great primer for how you might actually start using Agile. If you want to roll out Agile to a small to mid-sized team, then you may want to check out a lightweight Agile app called sprint.ly, which has an excellent overview video here. At Productivity Advisors, we have tried to incorporate Agile in our iteration cadence with clients. It has allowed us to be responsive in what we design and build for clients, and it has helped us to prioritize deliverables with clients. We have also developed a tool using Intuit's Quickbase to manage project tasks with an Agile style -- ping us to find out more.